I’ve gotten a lot of positive feedback on In the Shadow of The Lighthouse. People want more stories set in the Lake Erie islands. I love history and doing research so my stories, although fiction, are based in real places with some history thrown in. I love Kelleys Island and decided that my fourth book would be set there. Of course I need at least one contact person who I can pump for the bizarre and gruesome that will trigger a story in my head. Not an easy task when the island is only about four square miles in size with a population of just over three hundred permanent residents. This wasn’t going to be easy, but heck, I still have books two and three to finish. I thought about hanging out at one of the B&Bs on the island for a week or two, travel the back roads (really?) in a golf cart and look for an old-timer with stories of dead bodies, smugglers, and horrendous storms. That plan got put on a back burner. As the Executive Director for CANTER Ohio I see a lot of adoption applications from all over the country from people wanting to adopt our horses. I couldn’t believe my eyes when I saw that the potential adopter lives on Kelleys Island. Horses on Kelleys? Who would have thought? Even as a fiction writer I wouldn’t have put horses on Kelleys. Not only did my contact come to me, but she brought a resident of Marblehead with her. Oh yeah, she loved the horse. 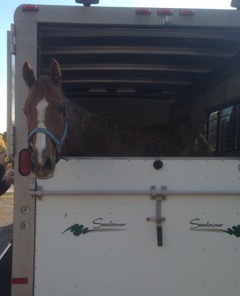 Stormy Dude, the tall chestnut ex-racehorse, left today for his new home. I wonder how he handled the twenty-minute ferry ride with the scents of Lake Erie and the raucous call of sea gulls overhead? So, serendipity stepped in and I have my contacts. I’ll be spending a lot of time on Kelleys Island searching for my next story. It may even contain a horse named Stormy Dude.